A few months back I became a member of the Simi Sunrise Rotary club. Our biggest fundraiser is a Cajun-Blues Music Festival. It funds nearly all of our other philanthropic activities. The lineup is set for both days, all day long and we just put out a new poster, which I thought I would share here. I will post more about this as the date approaches. The Festival is held during Memorial Day weekend, this year occurring on May 25th and May 26th. 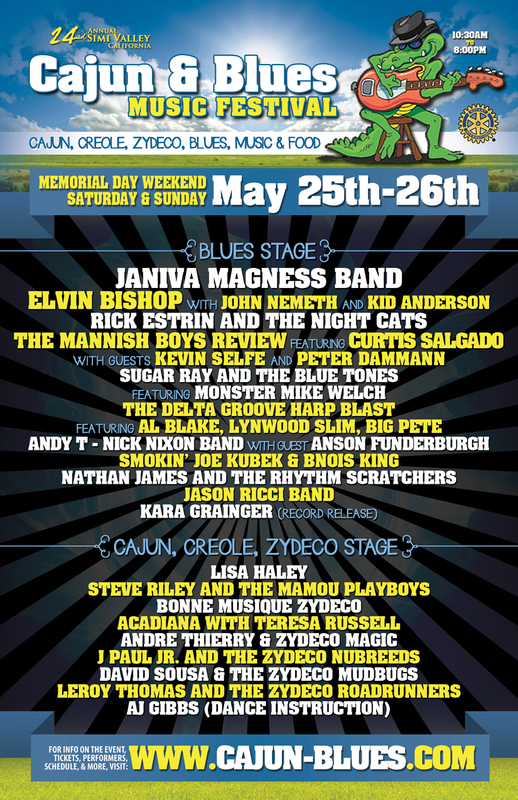 Two whole days of Blues and Zydeco, plus lots of good food and drink. There will also be a Mardi Gras parade each afternoon and lessons in Cajun and Zydeco dancing. This is our 24th year of putting on this growing and popular festival. You can learn more on Twitter here. This entry was posted on Thursday, March 21st, 2013 at 11:17 am	and tagged with Accordion, Blues, Cajun, Creole, festival, Fiddle, File Gumbo, Guitar, Mardi Gras, music, Philanthropy, Rotary, Simi Valley, Zydeco and posted in Entertainment, Family, Food-Cooking-and Eating, Professional. You can follow any responses to this entry through the RSS 2.0 feed. « What Goes Around . . .